As you plan your travels, it helps to consult a travel guide for how to visit a city such as Paris. This famous and beautiful city offers plenty of easy ways to pay top dollar for things that won't really enhance your experience. This page will link you to more information about when to visit, dining strategies, and information about affordable three-star hotels and other accommodation strategies, ground transportation, attractions and a host of miscellaneous money-saving tips. You can also view 10 quick money saving tips for Paris. Romantics will say spring, most everyone else will pick summer. For my money, the best time might be the so-called "off season" between November and April. Lines are shorter, budget accommodations are easier to find, and airfares are apt to be heavily discounted. But many people are limited in their opportunities for such visits. If you must go at a peak time, be sure your planning factors in longer lines and higher prices. Time will become a precious commodity. Use it carefully. Budget travelers are sometimes willing to eat ordinary food and save for other experiences. Paris food is a huge part of experiencing the local culture and should not be missed. 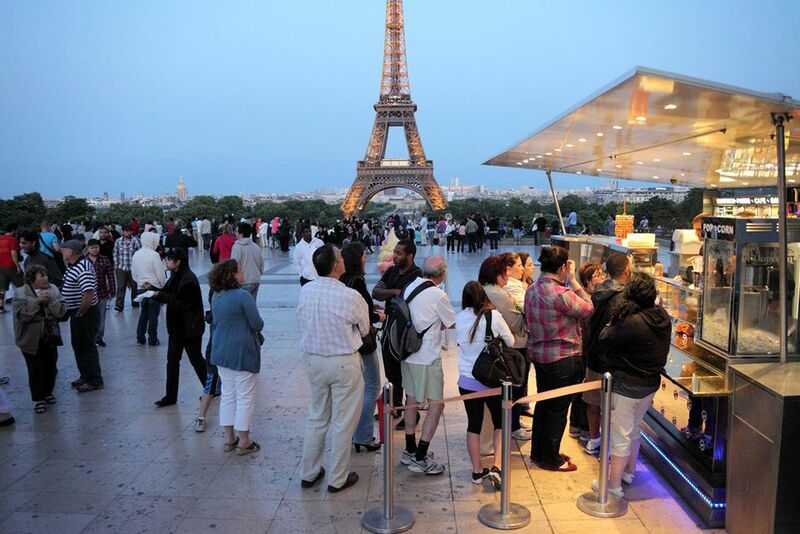 For that reason, budget dining strategies are more important in Paris than most other cities. Be certain to save up for a few nice restaurant meals. Another experience not to miss here is buying a meal at an open-air market. They sell fresh products at prices that don't include the mark-ups so commonly added in restaurants. It is a common experience for Parisians, and one you'll enjoy. Start your accommodation planning for Paris with a few simple facts: big breakfasts and spacious rooms are not always a part of the budget travel equation here. Unlike the bed and breakfast inns of the United Kingdom, value in accommodations here often focuses solely on location. How close will your accommodation be to the Metro line or to major attractions? Consider more than just hotel listings as you shop for a place to stay. Apartment rentals are an economical way to go for larger parties traveling together. Those who think Paris is too expensive are often quite surprised to find out transportation here is available at very affordable prices. The Paris Metro is among the most sophisticated and extensive mass transit systems in the world. It criss-crosses the city so completely that you'll find a stop within walking distance of almost any point of interest. Attraction information in Paris comes with generally good news for budget travelers. Many of the best experiences are either free or moderately priced. And did you know there is a pass that will enable you to skip lines at crowded Paris attractions and provide free transportation as well? Did you know the best view of Paris is not the one for which you pay lots of money and stand in line? Do you know about how gratuities work in Parisian restaurants? These are money-saving questions for which you need answers prior to your visit to Paris.